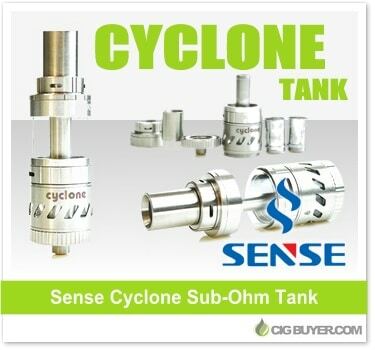 From the makers of the Herakles Tank comes the newest sub-ohm innovation from Sense – the Cyclone Tank. The Sense Cyclone Sub-Ohm Tank has fully adjustable dual airflow, a new top fill design, a rebuildable RBA head and is compatible up to 150W! It has an impressive 5ml of e-juice capacity and also includes an anti-splash system that minimizes e-juice spitback. Not only can you build your own custom coils, but the included 0.6 ohm head is rated 50W-150W and temperature control coils are also available (sold separately). Expiration of coupon code is unknown. Good while supplies last.